We went to visit my mother-in-law in Houston over the weekend, and she insisted that we go to see her favorite preacher, Joel Osteen, preach live. I actually watch his show every Sunday morning before mass. He’s really more of a motivational speaker than a preacher, and it’s hard not to enjoy watching his positive, “God Lite” message. Plus, I like to keep tabs on what he says since she quotes him in just about every phone call we have and really uses his teachings to guide her life. The only church services I’ve ever been to are the orthodox masses at my current parish and the occasional trips to the Dallas Baptist or Methodist churches that my childhood friends went to. They were all very quiet, sedate services. So when my mother-in-law leaned over to me in the car on the way over and touched me on the knee and said in her thick East Texas accent, “Jennifer, there are going to be some people here feelin’ the spirit” I was picturing the people I see at Mass on Sundays who have a glisten of a tear in their eye as they pray before communion. Umm, wrong. So I walked into the stadium and was stunned by the beautiful blue lighting on the roof and the gorgeous stage. The music started and it was LOUD. The atmosphere was more energetic than any rock concert I’ve ever been to as everyone jumped to their feet and started singing and waving their hands in the air. 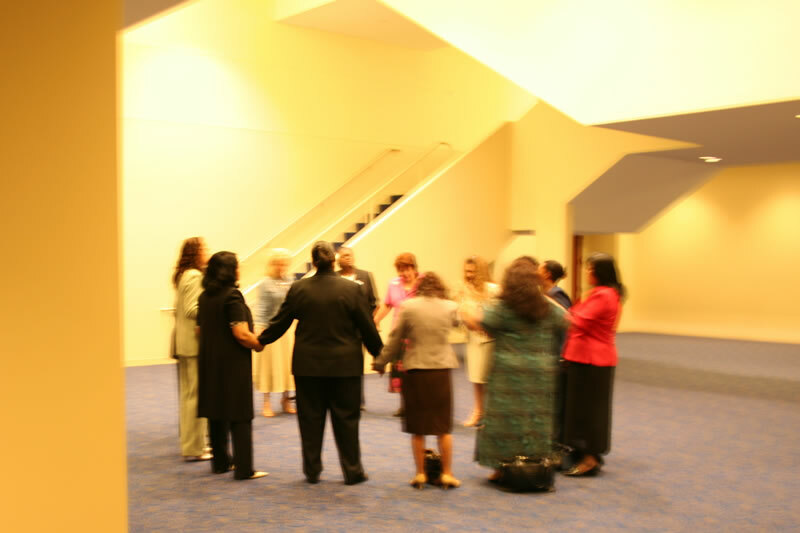 Then there was a quiet moment where “Prayer Partners” went around to pray with anyone who needed someone to pray with. Many people were in tears. And this was all before Joel Osteen even came on stage. My son kept looking at me and saying, “Church?” It was cute to watch his little mind try to reconcile how this is called the same thing as that place we usually go on Sundays. Osteen’s sermon of the day was about loyalty, and at one point he was talking about a nice letter his brother sent him when he was going through a tough time. The thought of the letter got him so choked up he couldn’t continue, and people in the crowd started yelling well-wishes and encouragement. It was quite an emotional moment. I think I even saw my husband wipe a tear from the corner of his eye. I’m not sure how many people were there but it was definitely in the thousands. And two characteristics of this huge crowd of people had me in awe: the first was the overwhelmingly positive vibe in the stadium. I didn’t know you could get that many people together under one roof and have zero tension. The good energy was almost tangible. I actually thought that if my hardline atheist dad was there even he would have been forced to crack a smile and kind of get into it. For the first time I could understand those people you see on TV who get so “into the spirit” that they end up dancing and rolling around on floors. The excitement was like a wave that swept over you that was really hard to resist. The second and most salient characteristic of the crowd was how seamlessly racially mixed it was. My (admittedly limited) experience, especially with Protestant churches, has been that religion is often a segregated affair. The Baptist and Methodist churches I visited in my childhood were 95% white and, honestly, I think a family of a different race might have felt uncomfortable attending services there. 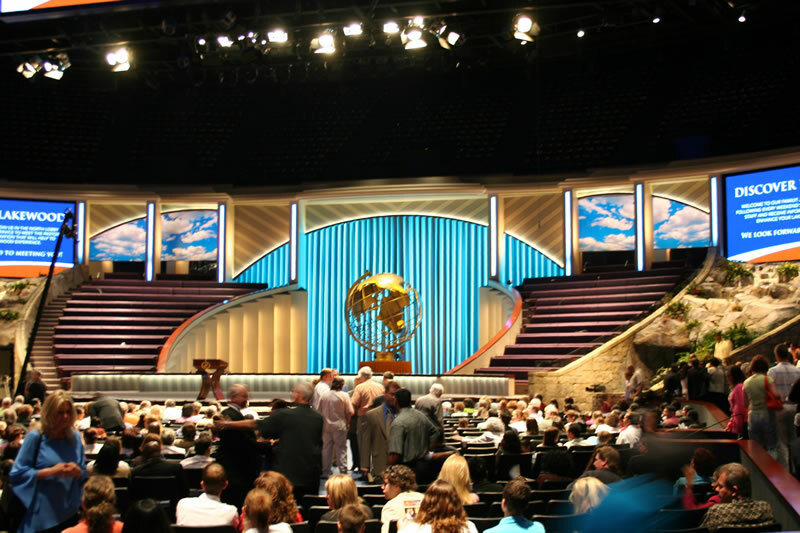 But the crowd at Osteen’s service was like some sort of united nations; it was impossible to pick out one particular ethnic group as predominating in the crowd. During the prayer service a young black Prayer Partner walk up to the two little old white ladies in front of me and asked if he could pray with them. They all held hands and prayed, and all three were hugging and in tears by the end of it. It was really touching. 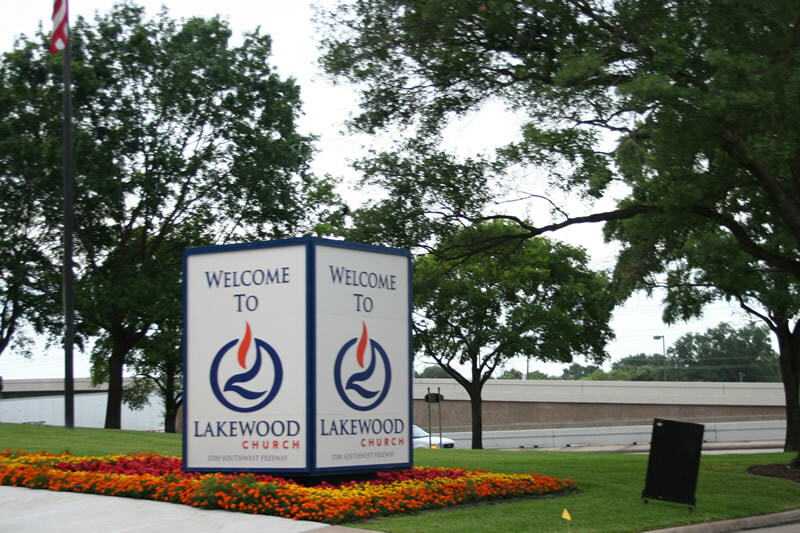 Though I think Lakewood is technically nondenominational my husband told me that this is probably what you’d call an Evangelical church service. So I had my first Evangelical church experience. It gave me a lot to think about, and came at an interesting time in my spiritual life. I have more thoughts than can fit into one post (and, as usual, it’s way too late for me to be up writing blog posts) so I’m going to throw together a Part II sometime later this week. « Are. You. Kidding. Me? This description makes me shudder. This was not a worship service you went to. It was a pep rally. I don’t have any doubt that it was full of fine Christian people but … my experience of such places has been that they are long on good feelings and short on taking up the cross and following Jesus. Still, I am glad you had a chance to see it up close and eagerly await the rest of your description. It certainly lacks the solemnity of a Catholic service but I don’t doubt that the spirit is present at these meetings–it is these types of experiences that motivated the charismatic movement in the 70s. I’ll also look forward to reading part II. Your comments make me think I’ll actually need a Part III to this post. I wasn’t even going to get to this in my follow up, but I noticed that a big subtext of Osteens message at this sermon (and in general) was “What’s in it for me?” He never spells it out like that but, for example, he talked about a woman he knows who selflessly took care of her aging parents and proclaimed that God is going to make sure that she has a long and healthy life because of her actions. Umm, I’m new to this whole Christianity but I’m pretty sure that that is not how it works. That sort of message particularly frustrates me because my poor MIL is often wondering why her life is so hard when she tries so hard to live God’s message — she keeps expecting that God will provide her with great friends and riches because she’s living his teachings. Also, I think that leads people to be fair-weather Christians if they’re always expecting payoffs for their sacrifices. It’s known as the ‘health and wealth gospel’, and it’s prevalent in a lot of evangelical communities. I even remember listening to a convert (to Catholicism) talking one time about his experience in such a church. This dude was suffering from cancer and even during the worst of his suffering, he was regularly upbraided because he wasn’t ‘allowing’ himself to be healed. This is the extreme of what you picked up on, but it’s very real, and it’s very contrary to the message of Christ that it’s through giving, sacrificing and suffering that we become what we are meant to be. I want to second Colleen’s comments. 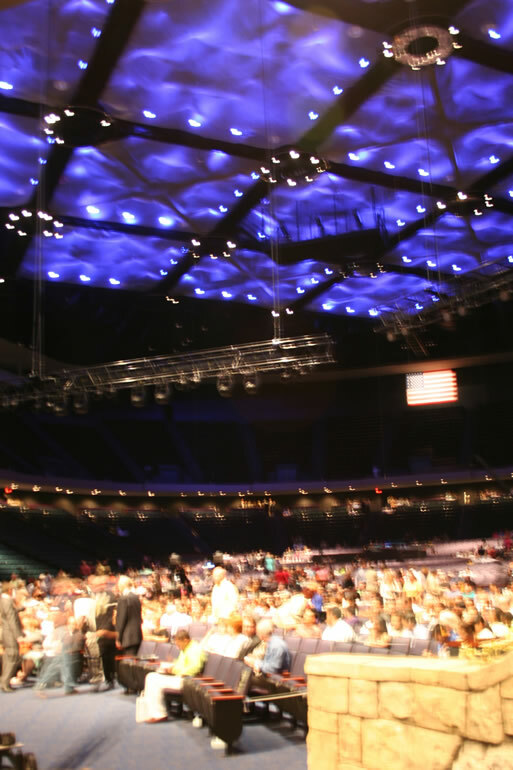 As a former evangelical myself, I’ve lived the truth that indeed they can put on a good show, and that there are many fine Christians in these denominations, but the there isn’t a ton of depth there. Another thing that I think is dangerous is that it too often becomes a cult of personality based on the preacher. I’ve seen whole church communities simply dissolve into thin air when a particular charismatic preacher left town for greener pastures. That can’t be right. What would happen to you MIL (and the others) if Osteen dropped out of the picture? I’ll take even a poor, boring, homily by a fuddy duddy old priest, coupled with the celebration of the Eucharist centered on Jesus Christ, over a hum dinger of a sermon of which the words of Jesus are but a pretext for the talents and charisma of the preacher to be displayed. Not saying that’s what Osteen offered, but it is what I found to be the case in my own experience. It certainly sounds like an interesting experience! Most people in my evangelical/Baptist church do not like Joel O. for many of the reasons that others have named “health and wealth gospel” and more….They also don’t like that Joel doesn’t “believe” in sin. I think I have caught him on TV once or twice, and definitely agree with your assessment that he is more of a motivational speaker than anything else. I look forward to parts 2 and 3.